Brick masons use cementitious mortar to create strong, stable joints between rows of clay bricks. While the look of these joints may seem like an afterthought for those focused on the beauty of brick, mortar joints actually make up as much as 17 percent of a brick structure according to the Brick Development Association. To maximize the appearance and function of your brick surfaces, take the time to choose from different types of brick joints based on the needs of each project. Concave brick joints represent one of the most popular mortar profiles used in modern brick construction. Bricklayers use a curved tool, known as a bucket handle, to compact the mortar between each brick. The compacted mortar takes the rounded shape of this tool and curves in away from the face of the wall. Flush mortar joints allow brick workers to create a smooth wall surface. They use a trowel to wipe away excess mortar so that the mortar sits flush with the face of the brick. This type of installation does little to compact the mortar, leaving it vulnerable to moisture penetration over time. Because they lack natural moisture-resistance, these joints are often used on walls that will be covered with paint or plaster, rather than on walls where the brick will be left exposed. V-joint mortar profiles feature a sharply angled design that can be created using a V-shaped tool or simple wooden block. These tools help to effectively compact the mortar within the joint, which offers some protection against moisture damage. A V-shaped joint is often used to conceal irregularities between different courses of brick and give it a more structured appearance. Squeezed joints serve as one of the simplest mortar joints that bricklayers can create. To utilize a squeezed joint, workers apply mortar to each brick without wiping off excess mortar. This allows some mortar to squeeze out from between the bricks and cascade down the face of the wall, giving the structure a rustic, classical design. Raked joints consist of rectangular profiles recessed into the mortar between each brick. Bricklayers achieve this design using a raking tools, which removes a small amount of wet mortar from each joint. The squared edges of a raked joint may allow water to collect around the mortar, which could lead to maintenance problems over time. Struck joints feature an angled top edge and a squared bottom edge. They are achieved using a trowel that's pointed down to remove excess mortar from the bottom half of the joint. This squared edge poses some of the same maintenance issues as with raked joints.. Weathered joints represent the opposite of a struck joint. Workers create these joints by angling the trowel up to remove excess mortar from the top half of the joint. This design helps to emphasize the clean, straight lines of the brick and poses none of the moisture issues of raked or struck joints. Beaded brick joints give a structure a formal, old-fashioned look. Bricklayers create this look using a special mold that creates a convex joint with a second thin curve along the center. This thinner curve creates a unique shadow pattern. The inverse of this profile is a grapevine joint, which is created using a grapevine tool. 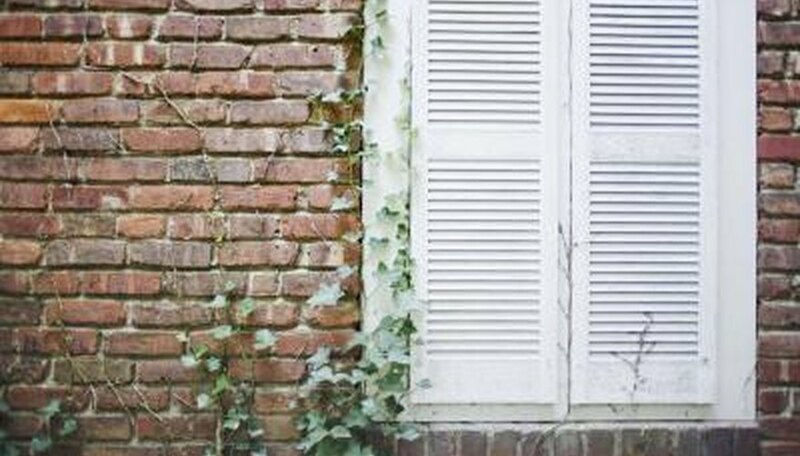 Grapevine joints are often associated with Colonial architecture according to the International Association of Certified Home Inspectors.